Can You Get Discounts for Paying Cash? 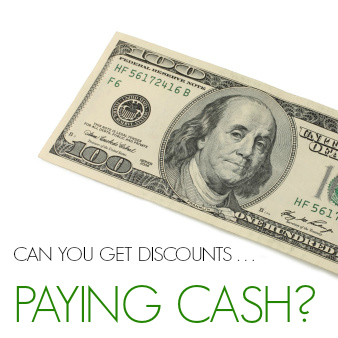 Home / save money / Can You Get Discounts for Paying Cash? Now that the use of credit cards and debit cards has become so universally accepted, we can often forget that paying cash offers certain benefits. Some merchants and businesses may provide a discount for cash for a variety of reasons that we don’t normally think of. Though we often associate merchants accepting cash as being primarily a tax dodge, there are actually very tangible reasons why a business might do it – and even provide you with a discount to encourage you to pay cash. Credit cards and debit cards are quick and easy – no doubt about that. But from a business owner standpoint, they also charge fees. These fees are typically in the 2% to 3% range, but a merchant might offer a discount for cash simply because they are tired of paying fees to the bank. From a psychological standpoint, accepting cash may be the merchant’s way of “sticking it to the banks.” It may enable them to feel less dependent upon banks for their living. When accepting credit cards, merchants have to be concerned about the potential for chargebacks by the customer. If you return an item that you paid cash for, you’ll have to dispute the transaction directly with the merchant. But if you go through the credit card company, they can initiate a chargeback against the merchant with very little input from the merchant. This is especially prevalent with service-type businesses. When a business accepts credit cards, they can never be entirely certain that all of their sales will remain intact. A certain number will be charged back in any given month, and that will reduce profitability and the overall benefit of accepting credit cards. Most businesses need payment yesterday! Accepting credit cards often involves a delay in receipt of income for several days or longer. If it accepts checks, it will have to wait for the checks to clear before accessing the money. As a result, the business may accept cash if for no other reason than it has immediate financial needs. The advantage to cash is that it is both immediate and unconditional. The business owner can spend the money as soon as it is received. And if they deposit it in the bank, the access is immediate since there is no need to wait for funds to clear. It’s without question that some businesses are more dependent on cash than others. A merchant may operate in a business environment that typically requires cash, rather than checks or credit cards. It could be a tradition of the business, or it could be more tangible reasons. For example, if a business operates largely with immigrant labor, its employees may insist upon being paid in cash. This is often because the employees don’t have a banking relationship and would be forced to rely upon check-cashing services otherwise. The business owner may find it impossible to hire employees if they pay them in anything other than cash. Since payroll often consumes a significant percentage (and often the largest) of a businesses cash flow, the need for cold, hard cash may be particularly high. Still another situation may involve the merchant’s personal financial situation. If they have financial problems – particularly credit issues – payments in cash may be especially welcome. The immediate nature of cash will make it easier to handle debt payments and other obligations. For starters, let’s eliminate the businesses that are unlikely to provide cash discounts. These would include large chain operations and likely most franchise businesses as well. And obviously paying in cash would not garner any favor in paying tax bills, loan payments or utilities. As to the businesses that are likely to welcome cash – and provide a discount – this would include any small, privately-owned businesses. This can include retail merchants, restaurants, repair services, housekeeping services, and even medical providers. Though paying with cash has become much less conventional than it used to be, there are plenty of businesses that would be more than happy to provide a discount if you did. How much of a discount should you expect? Some businesses may provide no discount at all, while others may offer discounts as high as 10% or 20%. It will all depend upon factors behind the scenes (as discussed above) that the businesses are dealing with. Try offering cash in exchange for a discount for any payments you make to any privately-owned businesses. The worst they can say is “no,” but they may say “yes” – and then you’ll save some money. Do you ever try to work out cash for a discount? Or are you strictly a credit/debit payer? Leave a comment! 6 Responses to Can You Get Discounts for Paying Cash? I know it’s in every credit service contract that the merchant is not allowed to add a fee for customers using a credit/debit card. I wonder if having a discounted price for cash customers is effectively a credit card fee? The merchant could lose their contract, and not be able to accept cards at all. I kind of doubt that Amy. A business always has the option to discount it’s prices, and I don’t see credit card companies being able to stop that. So few people pay with cash – and ask for a discount – that I can’t see that happening anyway. I do get cash discounts when it comes to big things. We got our Fridge, Stove, and dishwasher all for around $1000 because I was paying cash. It is amazing how much you can save if you are willing to negotiate! I think that a lot of people are just hesitant to ask for a cash discount. The worst anyone can say is NO, and then you won’t be any worse off. But if they say YES you’ll have found money in the form of a discount. I would love to hear some real world examples since I exclusively pay by credit for the rewards. I certainly have never been offered a cash discount, but I’ve never asked for one either. Try asking the next time you use a local business or service. Though some might refuse, you might be surprised to find others that do.